1977-1980: William Kirker, Leslie Walker, Eloise Beach, Fritz Kubisch, W. R. Paylen, Amy Jean Gilmartin, Edgar Smith. Thelma O'Reilly. Picture on the Cover — Vriesea imperialis. Photo by J. Padilla. As the Bromeliad Society will hold its thirtieth birthday celebration this year, it seems appropriate that we pause for a moment to remember the many fine bromeliad enthusiasts without whose help the Society might never have been formed. First of all, there was Joseph Schneider, of the Huntington Botanical Gardens in San Marino, California, who started it all by forming a bromeliad round robin for the Flower Grower magazine. The ten members, nine of whom resided in southern California, formed the nucleus of the present society. One of these was Frank Overton, who held the opening meeting in September, 1950, in his home in Glendale, California. He served as treasurer for many years. To this meeting came David Barry, Jr., who had the largest bromeliad collection in the West at that time. He brought with him an old friend, Mulford B. Foster of Orlando, Florida. When the meeting was over, the Society was off on a firm footing with Foster as president and Barry as vice president. Mr. Foster was to keep the presidency and also the editorship of the Bulletin (now the Journal) for ten years. He was succeeded by Mr. Barry as president, who in turn was followed by James Giridlian. Mr. Giridlian was an international authority on rare bulbs, as well as bromeliads, and his Oakhurst Gardens was the mecca for plant lovers the world over. Excitement over bromeliads began to be felt in other parts of the country, and the first affiliated group was formed in New Orleans by Eric Knobloch and Morris Henry Hobbs. Mr. Hobbs was an artist of national repute. His beautiful drawings decorated the covers of the Bulletin from March-April 1959 to March-April 1964. Down Under, Mrs. Muriel Waterman of New Zealand and Charles Hodgson of Australia were indefatigable workers in spreading the cultivation of bromeliads and in forming societies in their respective countries. On the Continent, Dr. Richard Oeser of West Germany was the leading exponent of the tillandsia cult for many years. 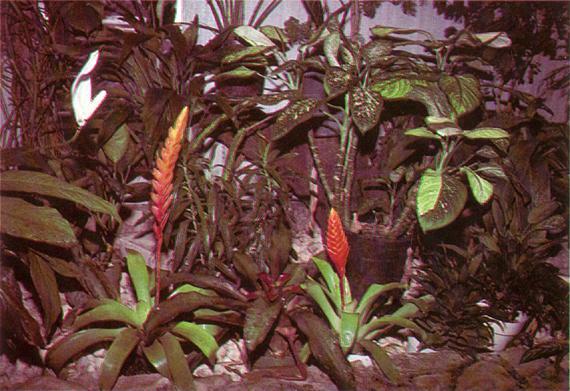 It is to the memory of these ardent bromeliophiles that we dedicate the issues of the Journal to appear in 1980. In each issue we will reprint articles which they wrote. There are, possibly, more species of tillandsias carrying fragrance than those of any other genus in the Bromeliaceae, at least of the bromeliad species that bloom in the light-hours of the day. Tillandsias also have a habit of retaining their individual flowers over a much longer period of time than the majority of bromels. Few bromeliads retain their flowers in good condition more than twenty-four hours but many of the xerophytic tillandsia species hold their blooms in good condition from three to five days, and it is some of these species which retain their perfume, that we wish to mention in this paper. Most of the outstanding odoriferous species are xerophytic in habit, such as T. decomposita, T. duratii × T. tucumanensis, T streptocarpa, T. crocata, T xiphioides, and, of course, T. usneoides, as well as others. Nearly all of them give off an exquisite scent every hour throughout the day as well as at night. All of these species are at home in the southern countries of South America, such as Argentina, Paraguay, Bolivia, Uruguay, and southern Brazil. Considering the plant contour, we observe that the majority of all the bromeliads are relatively symmetrically formal or well-composed in their shapes. However, a number of the fragrant species seem to be quite lacking in symmetry, or as the botanist would say they are "decomposed," being almost grotesque in form. 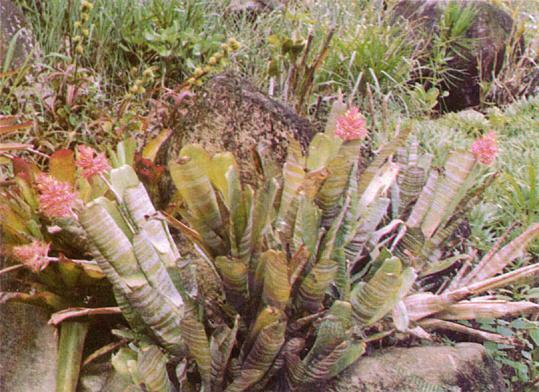 The best examples of this characteristic are T. decomposita, T. duratii and T tucumanensis, all of which have heavily lepidote (scaly) curled leaves and twisted stems making the plants attractively distinct in form. They have roots only during their early (juvenile) years and later they hold fast to the tree branches by their tightly curled, clinging leaves. Thus, they can adapt themselves to harsh, xerophytic conditions on scrubby shrubs or cacti and on rocks. 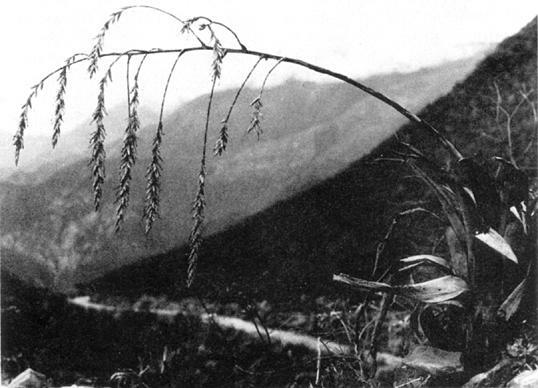 T. usneoides, for example, has been seen to hang from edges of palisades-like rocks (near Bogota, Colombia) in great sixty-foot tresses, a phenomenon of adaptation as well as an example of the continuously self-elongating habit. The pure white flowers of T. xiphioides have a delightful spicy fragrance. This tillandsia is remarkable in more ways than one. It may surprise the objective observer who does not go around smelling every flower he sees, that the commonest of all the tillandsias T. usneoides (Spanish Moss) disseminates from its single tiny and fragile greenish flower, one of the most elusive and delicate of fragrances between the hours of "first dark" and midnight. Perhaps only a few curious persons who, wandering under the Spanish Moss and experiencing this soft spring-night fragrance permeating the air on a March or April night, have traced it to its origin. In fact, the majority of folks are unaware that this fantastic bromeliad ever "wears" a flower, much less one that "breathes" a perfume which any parfumeur would want to capture in a bottle. There are, no doubt, many more fragrant tillandsias than those we have mentioned, as well as species of other genera that offer a fragrance, so let's stick our nose a bit further into this subject! 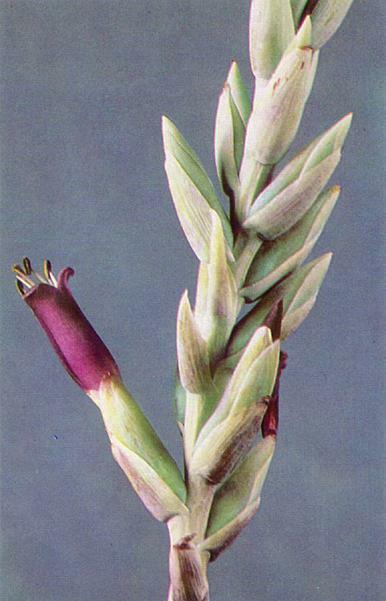 Dr. Richard Oeser, of West Germany, continued with the subject of fragrant tillandsias in his article published in the September-October, 1967 issue of the Journal, a part of which is reprinted below. Among the bromeliads there are a considerable number that distinguish themselves by having a pleasant scent. In fact, some of the names of plants designate that they are blessed with a fragrance: Aechmea suaveolens (A purpureo-rosea), Vriesea fragrans, and Neoregelia olens are three such bromeliads. I have become acquainted with quite a number of very fragrant tillandsias. These are mostly South American species, but the fragrance of T usneoides (Spanish Moss) enjoys praise when it blooms in masses in the Everglades of Florida. However, our nose isn't sufficiently sensitive to perceive the fragrance of a single T. usneoides flower. And similarly it is quite possible that many bromeliad flowers issue a definite odor that attracts certain insects — this is especially true of species with white flowers that seem to attract insects during the night with their fragrance. Such a species is the little white-flowered Tillandsia dyeriana from Ecuador with its oddly branched inflorescence and pretty dark-spotted leaves, soft like those of a vriesea. The Argentine to Paraguay and Bolivia is the home of white-,blue, and yellow-flowered tillandsias that have a very strong perfume. When a Tillandsia decomposita produces for weeks in succession ever new flowers along its 2 to 3 foot long stalk, the entire glass house is pervaded with a sweet fragrance, especially in the morning and in the evening. T. streptocarpa has a similar odor, but it is weaker. Tillandsia xiphioides has rather large white flowers that give off a very strong carnation-like scent. (In German, the fragrance of carnation and clover are given the same name. I can't say which it should be in this case). A tillandsia I received from the Chaco in Paraguay under the name T. arhiza is said to have flowers 5 cm across, white, with a stunning scent. It has a stem two feet long with many side shoots. Entirely different from the white or blue-flowering species are those that have yellow flowers — usually small plants, thickly covered with scales. The strongest scent I have noticed is in T. crocata's long orange colored flowers. When it is in bloom the surrounding air reminds one of cinnamon. A near relative of T crocata is the T. myosura group, whose leaves, because they look like a mouse-tail, give the plant its name. It has very small flowers, honey-yellow to brown, all very strongly scented. The most interesting point on this subject is that shortly after World War II along with the first tillandsias arriving in Germany from the Argentine came the information that in that country they were making perfume with tillandsia flowers. Many plants are being cultivated commercially for making perfume, especially in southern France. If making perfume from wild tillandsia flowers has proved successful, although collecting in the wilds is probably a difficult task and will sooner or later erase the supply, the setting-up of a tillandsia farm on a land not suited for other types of culture, is not so absurd as it might seem at first sight. It would be a long while before a tillandsia could be expected to yield profits; but once that stage is reached, crops could be counted on year after year and harvested without too great pains, for tillandsias never die, but regenerate spontaneously. Dr. Edward L. McWilliam, of Texas A & M University Horticultural Science Department and former member of the Board of Directors of this society, was awarded the 1979 Alex Laurie Award for his work on the determination of light compensation points and acclimatization (conditioning) of house plants. The idea is to convert a sun or light loving plant to one better adapted to shade. The conversion process involves changes at the cellular level that reduce respiration rates. Mc-Williams said that much of his research was done with the help of a Beckman gas analyzer, donated in 1973 by the Bromeliad Society/Houston. How many times has it been said that neoregelias are right at home in the Gulf Coast area of the United States, but take them out of the South and they'll go green?! This has been the experience of far too many bromeliad growers in California and in the upper limits of the Sun Belt. And it is indeed sad, since foliage in the genus Neoregelia can be the boldest and most durably-colored of the entire bromeliad family. It is true that under the cool conditions that some hobbyists and commercial men are content to grow Neos. those species whose character, colors and markings are essentially light/heat oriented will never approach the quality of color or markings that can be achieved along the Gulf Coast. However, if these same people would attempt to duplicate the conditions that prevail in this area, they would find that the most essential ingredient lacking in their treatment of neoregelias is heat. They already have sufficient light, they can provide humidity by sprinkling, but those who grow their Neos. in greenhouses try to hold down the temperature. Even a couple of the commercial growers provide cooling pads and fans to hold the heat below 80°F. ; yet, Neos., for the most part, are a heat-loving genus. It would be altogether better for the Neos. if these growers would turn off the fans and let the temperature climb to a bit above 80 °F. On my three trips to Southern California within the past year I took with me a General Electric light meter that reads directly in footcandles. Readings were taken from San Francisco south to Long Beach, and despite the fog, smog, and otherwise dull weather, sufficient natural light to color-up neoregelias was available both winter and summer. For days on end my meter read between 6000 - 7000 fc. and above. Even on days of poor light quality my meter read within the acceptable range of 2300 - 3800 fc. So, if sunlight alone were the essential factor to good color, etc., there is plenty in California to achieve excellent color. Yet, the "mystery" seems to prevail! Well, as I have indicated above, an equally essential factor in achieving high color is heat. It is necessary to provide temperatures at least in the high 70's and even into the low 80's for at least part of the day. During the winter when all of my plants are inside the greenhouses, I allow the temperature to climb with sun heat to the high 70's or above before ventilating. After a wetting-down of the under-bench area, as well as a light wetting of the Neos., the roof vents are opened a few inches to provide a slow exchange of air and a drying-off of the foliage before nightfall. Equally as important as high daytime temperatures is a sufficient drop in temperature at night. However, I do not subject my plants to temperatures below 50°F. Before this point the heaters go on automatically. During the summer along the Gulf Coast and even into Florida as well, neoregelias lose a bit of brilliance simply because the outdoor night temperatures remain too high. If they could be lowered into the high 60's, the brilliance would remain. Now, to fill out the rest of the year for you, I'll add that Neos. are at their best all along the Gulf Coast from the middle of March through the middle of June, if the nights remain cool that late in the spring. Thereafter, they lose some of their lustre because the night to day differential is too small. However, they still have fine, deep color during July and August, even into September. By late September as the nights begin to cool, they again begin to beam with color. Most of the mature plants remain outdoors until the nights get down into the low 50's, about the end of November. Thereafter, comes the indoor season that I have explained above. Well, in summing up, if you can provide the sun heat in a closed area during the day, provide at least 2300 footcandles of sunlight, the third ingredient — humidity — will be no problem. (Generally speaking, neoregelias revel in humidity above 50%.) So, don't be afraid to give'em the heat treatment! I'll bet you will get a lot more color in your Neos. if you do! A number of the affiliates are to be congratulated on the excellence of their bulletins, combining both affiliate news and helpful hints about growing conditions in their immediate regions. 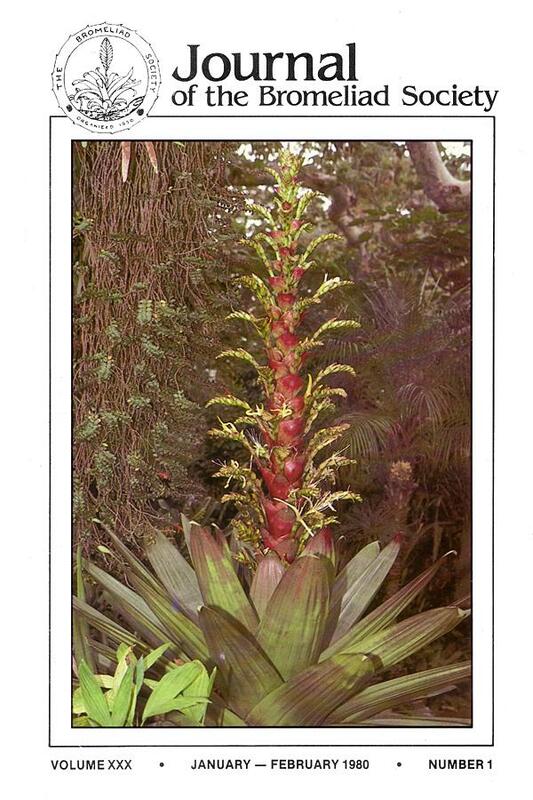 These chatty little bulletins — the Bulletin of the Bromeliad Society of New Zealand, Bea Hanson, Editor, and the newsletter of the Florida West Coast Bromeliad Society, Henry J. Rahmlow, Editor, for example, are fun to read. 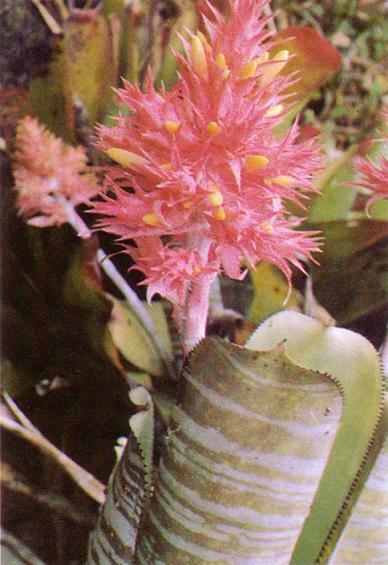 The epiphytic way of life provides one of the more interesting facets of the Bromeliaceae. It appears to be a fairly old way of life, preceding the origin and evolution of bromeliads by several hundred million years. A possible epiphyte has been recorded from the Pennsylvanian age, 310 million years before present (Dimichele & Phillips 1979). Epiphytes appear to be distributed with latitude; as latitude increases, the number of epiphytes decrease. In the tropics, they have a considerable influence on their hosts, as a heavy load can cause branches to break and trees to fall. This may provide a reason as to why so many tropical trees have buttressing, so as to resist toppling (Strong 19797). Hollow trees, containing bat colonies, have a greater epiphyte load because of the fertilizing guano provided, unintentionally and free of charge, for the plants. The density of epiphytes can create problems not only for the trees but for animals using them. Perry (1978) has noted that on some roughly horizontal limbs, the upper sides are bare, while the other sides are crowded with epiphytes. It appears that these "highways" are kept clear by the squirrels and monkeys using them, and some may even do a little pruning. Interaction between epiphytes occurs only if they are on the same branch. Neighboring branches are affected if the bromeliads are crowded so much that they shade other branches. A stable environment exists to within 2 cm or so of the end of a branch, as indicated by the presence of flowering plants. Slow growing branches provide a uniform habitat whereas faster developing branches have a smaller diameter near the end and therefore have a smaller area for seeds to land on and germinate (Hazen 1966). The microclimate of the forest canopy is unstable. There is a rapid decrease in light intensity of the upper part, less so on cloudy days because of diffuse light. 45% of this light is red and 22% is green. As foliage density increases, long-wavelength light intensity decreases more slowly than short-wavelength light; thus red light comes to predominate (Geiger 1961). The reduced sunlight infiltration caused by epiphytes keeps the relative humidity high within the forest (Weaver 1975). %RH decreases as tree height increases and is lowest in the canopy. 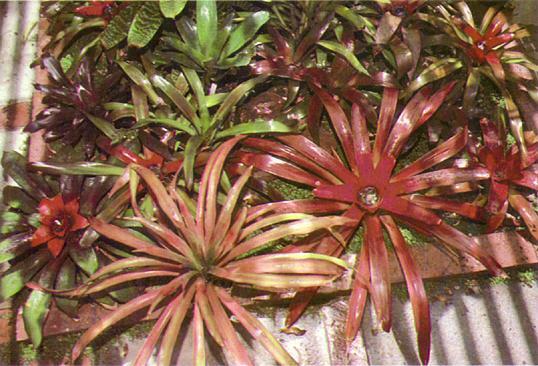 On the bromeliads, the lower surface of leaves have a higher %RH than for the upper surface. Likewise, younger leaves have a high %RH along their boundary layer relative to older leaves (Yarwood & Hazen 1944). When it rains, the canopy absorbs precipitation for several hours before letting it through to the ground. Interception is greatest when rainfall is brief, light, or intermittent, and decreases in heavy or continuous rain. After the rain stops the canopy may continue dripping on the bromeliads for several hours. Most important for epiphytic bromeliads is the stem flow which occurs as branches funnel water down the tree trunks (Geiger 1961). The stem flow volume is about 2%-8% of the rainfall and 80% of it occurs on trees less than 10 cm in diameter (Jordan 1978). Geiger, R. (1961) The climate near the ground. Publ. by Harvard Univ. Press Cambridge, Mass., transl. by Scripta Technica. The Greater New Orleans Bromeliad Society's ninth annual bromeliad show and sale will be held on April 26 and 27, 1980, the weekend before the Conference show in Orlando, Florida, May 1, 2, 3, 4, 1980. If you are planning to attend the show in Florida, why don't you start out a little early and see our show on your way down? We promise a spectacular show of old favorites and many new varieties. And even though Elmer Lorenz termed us "the neoregelia capital of the world," we are just as fond of all the other beautiful bromeliads as we are of our neos. In the past two years many of our members have begun to make magnificent arrangements utilizing bromeliads as the focal point. Each year the competition is stronger. We are proud of our bromeliads 'way down yonder in New Orleans — come on down and see. Lipids in plant or animal tissue are a loosely defined group of compounds which can all be extracted by fat solvents such as ether, alcohol, benzene or petroleum ether. A mixture of 2 parts of chloroform to one of methanol is the most common solvent for biological materials. The group thus includes such widely divergent materials as fats, phosphatides, waxes, lipoproteins, aliphatic alcohols, terpenes, sterols, fatty acids and others. Some of these are important components of all membranes. Some of these compounds are unquestionably active growth regulators in plant tissues, but they have not been claimed to be true plant hormones. They can, in some instances, enhance or modify the action of one or more of the true phytohormones. Thus some of them can promote cell respiration, promote auxin-induced cell elongation, or can augment the formation of ethylene in plant tissues. The latter reaction is doubtless responsible for a curious commerical application of a lipid which was used in ancient Egypt, according to the first botanist of record, Theophrastus, who wrote in ancient Greece and was a pupil of the philosopher Aristotle. The ancient Egyptians produced early crops of figs by placing a tiny drop of olive oil on the eye of an unripe fig. We now know that this practice induced the formation of ethylene which in turn hastened the ripening of the treated fig. This unusual response has been studied intensively by two botanists, Juze Hirai of the University of Osaka Prefecture in Japan and Bruce Stowe of Yale University. The latter investigator has studied this reaction for about two decades. Olive oil is largely triolein. Stowe considers linoleic acid to be one of the most active substances in this reaction. This substance oxidizes in air to form four shorter fatty aldehydes. He has proposed the term "oleanimin" for a lipid which is active in promotion of growth. These compounds are effective in exceedingly low concentrations. Stowe found that the side chains had to have at least 12 carbons but could not be much longer, in order to show activity. Dimethyl sulfoxide (DMSO) was found to be active in producing fig ripening, along with a number of alkyl or isoprenyl hydrocarbon derivatives. Stowe found that a fairly limited length of the side chain was necessary for activity, 12 carbon atoms being the minimum. Stowe believed that the active lipids act on the membranes of the plant cells, forcing apart lecithin molecules and thereby changing the electrical charges or the chelating properties of the membranes. A research group in the U.S. Department of Agriculture has discovered another group of lipid substances which they have termed the brassins. These can cause cell elongation in some plants. Certain lipid substances can cause protoplast fusions in plant tissue cultures. Some of the lipids have been claimed to promote flowering of plants after floral initiation has taken place. This is a curious bypath of plant research which was carried on by Dr. R. H. Roberts, Chairman of the Department of Horticulture at the University of Wisconsin, beginning at about 1951 into his retirement years. 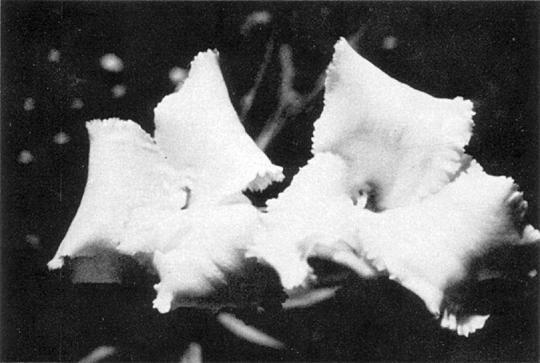 Roberts called the lipid fractions which he extracted and sprayed on plants "anthogens." He was always very careful to state that these compounds had nothing whatever to do with floral initiation, but instead they promoted or amplified flowering considerably on induced plants. In his early experiments, he extracted the compounds from photo-induced cocklebur plants in four different stages of development. In his later experiments, he extracted these lipid compounds from carnauba wax. He reported his results annually at various science meetings. I once had a long discussion with him regarding his investigations, and I remember that he was using kerosene for the extraction. I do not remember what carriers were used in the sprays applied to the plants. Possibly an emulsion was used to prevent toxicity. He reported at the International Conference on Plant Growth Substances held at Gif-sur-Yvette in France in 1963 that he had obtained improved flowering and fruiting in 284 species of plants from 31 different families. His numerous colored slides of his results were excellent and were convincing. He claimed that one of his active compounds had 72 carbons but only two oxygens but apparently did not determine the arrangement of carbons. He left such a scanty record of his experiments that it is difficult to tell what he actually did, and accordingly his work was ignored and never followed up. I am inclined to believe that he narrowly missed discovering triacontanol, which we have discussed in these pages previously. I believe that his claims should be reexamined in the light of newer information on the action of the plant lipids. For the first time in North America, Montreal will host "Les Floralies internationales," always a major event in the horticultural world. Of special interest to the members will be the Indoor Floralies, which will be held at the Olympic Velodrome on May 17, to May 29, 1980. The Velodrome, built for the 1976 Olympics, will be transformed into a valley of flowers, measuring 6,000 square meters, to be created by horticulturists from around the world. Visitors will see cut flowers, potted flowers, tropical and subtropical plants, Cactaceae and succulent plants, Orchidaceae, Bromeliaceae, nursery plants, floral-art and dried-flower displays, etc. Tillandsia spiraliflora RAUH nov. spec. In "Bromelienstudien" VI (Tropische und Subtropische Pflanzenwelt 18, 1976) a new Tillandsia from northern Peru (Maranon-Valley above Balsas) has been described as T. spiraliflora this means that the flowers of the spikes of the bipinnate inflorescence are arranged not in exactly 2 ranks (distichous), but spirostichous. Normally, this is known only from the genus Guzmania. Nevertheless we know Tillandsias with a spirostichous arrangement of the flowers, but all these species have simple, unbranched, erect or pendulous inflorescence, but we don't know up to today any Tillandsia with compound inflorescences and spirostichous arranged flowers of the spikes. On our trip into the valley of the Maranon (Northern Peru) we found, above the small village Balsas, 2 new species: a very tiny one, which resembles a dwarf form of T. tectorum and which was named T. balsasensis RAUH (see "Bromelienstudien" VI in Tropische und Subtropische Pflanzenwelt 18, 1976, p. 335-338; see later) and the other one was Tillandsia spiraliflora. The latter is one of our most interesting discoveries of bromeliads of the last years. Also in vegetative estate T. spiraliflora is a striking plant; the numerous leaves form big rosettes of a height of 60 cm and a diameter of 70 cm; the sheathes are lanceolate-ovate, up to 17 cm long and 12 cm wide, inconspicuous, dark-brown on the upper side and pale-brown lepidote beneath, with violet margins. Blades lingulate, at the base 7 cm wide, up to 40 cm long, slightly succulent; on the upper side light-green, underneath metallic-grey-blue, lepidote. Inflorescence pendulous, mostly bipinnate with a thin, red, glabrous axis and about 10 long pedicelled, pendant spikes. Scape curved, up to 1 cm long and 1,5 cm in diameter, green to wine red, glabrous, waxy, scape bracts longer than the internodes, subfoliate, the upper ones with a wine red sheath and short, densely lepidote, acute blade. Primary bracts small-triangular, 2,5 cm long, 2,4 cm wide, wine red beneath, much shorter than the long sterile base of the spikes; these up to 25 cm long, with angled, carmine axis, many-flowered. Floral bracts spirostichous arranged, ecarinate, 13-17 mm long, carmine, obtuse, when dry strongly nerved, fresh even, white-waxy, shorter than the sepals; these are 18-20 mm long, the posterior slightly carinate, green, gray-waxy, glabrous, even, equally free. Petals narrow-lingulate, up to 35 mm long, with recurved obtuse tips, dark-violet, whitish to the base; stamens and style long exserted. The remarkable arrangement of the flowers of T spiraliflora can be explained in the following manner: In the young stages of the spikes the flowers are arranged in 2 ranks. In course of the development of the spikes, however, their axis begins to twist, and the result is a twisted, spirostichous arrangement of the flowers. Sometimes one can see the twisting, when looking from above on a spike. Unfortunately no young stages were at hand, although the plant has already flowered in cultivation, but exactly in this time the author was absent from Heidelberg and on expedition. T. spiraliflora grows on sandstone rocks in an altitude of 1700 m, about 12 km above Balsas, in the deep interandine valley of the Rio Maranon associated with a lot of interesting succulents and cacti. T. balsasensis growing on sandstone rocks 12 km. Tillandsia balsasensis RAUH nov. spec. In the same locality we found in nearly accessible steep rock walls of the valley another new Tillandsia, T. balsasensis RAUH, which looks from the distance like a dwarf form of T. tectorum; but it differs from it by the simple (not branched) inflorescences; the red, glabrous bracts and the uniform white (rare white-blue) petals. 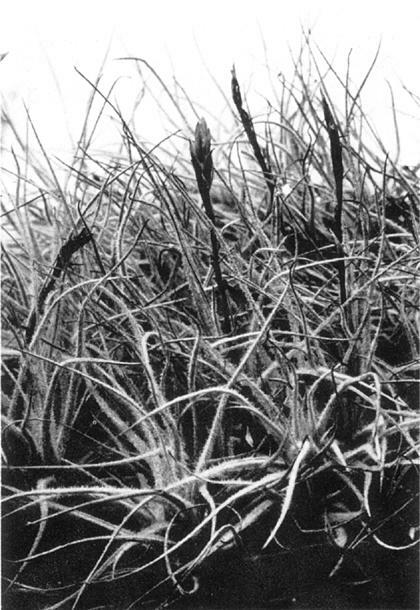 Therefore, T. balsasensis has no affinities to T. tectorum. It forms big, lax clusters; the simple plant has an elongated, thin, rooting stem, which ends in an erect, 15 cm high, many leafed rosette. Sheathes small, 1 cm long, 6 cm wide, white-brownish, inconspicuous; blades filiform, involute, up to 8 cm long, 3 mm wide, long attenuate and densely covered with white squarrose trichomes; these are eccentric, with yellowish central cells, scape erect, up to 8 cm long, 2 mm in diameter, glabrous, reddish; the basal scale bracts subfoliate, the upper ones with a long sheath and a short, lepidote blade. Inflorescence with a simple, complanate spike; this is 2,5 cm long, 5-6 mm wide, 5-6 flowered. Floral bracts densely imbricate, erect, 8-10 mm long, sharply acute, carinate to the tip, bright-red, whitish to the base, even (nerved, when dry), longer than the sepals; these 9 mm long, membranaceous, glabrous, acute, pale-red; the posterior carinate, equally free. Petals mostly uniform white, rarely bicolored, pale-violet at the tips, whitish to the base, postfloral reddish, 13 mm long; stamens and style included. Up to today this interesting plant is known only from the type-locality. Collection number: RAUH 38570. Locality: Steep sandstone walls above the village Balsas in 1700 m altitude. The Bromeliad Society of Greater Chicago and The Illinois Orchid Society will be holding a joint show April 12 and 13, 1980. It will take place at the Chicago Botanic Garden, Lake Cook Rd., Glencoe, Illinois. The two societies are proud that they can show together the plants which grow so well together. Affiliated bromeliad societies in the midwest and individual Bromeliad Society members are invited to participate. They can contact the Show Chairman: Janine Kurth, 1324 Dobson St., Evanston, Illinois 60202. I have crossed Hechtia epigyna with a dyckia I call Wal Charley's 'Dark Chocolate' (none of the W. Charley collection had a name on it when the plants were sent to me). It will be interesting to see what results I get from the fat seed pods. When H. epigyna flowered last year (female plant) the only pollen I had was from A. recurvata v. recurvata, so I was surprised to find both flowers that were pollinated set seed. Before it was ripe, someone took the pods so I still don't know if they would have germinated. Do you know anyone who would be interested in growing some of the Hechtia-Dyckia seed, in the view of registering the cross for me? Olwen Ferris, Bromeliad Display Garden, 81-83 Pine Ridge Rd., Paradise Point, Queensland, Australia. We live on the east coast of Florida, rather centrally located. Our county of Brevard is best known for Cape Canaveral and the manned moon landings. Now we once again are being threatened by a hurricane. The last good blow was 19 years ago, and life has changed a great deal for me since that time. Bromeliads were those plants that attached themselves to trees all over the state. Now, after five years and some months of collecting, I have thousands of plants to protect. Stress is high. Hurricane David is on his way. We have ample warning, he will not arrive unheeded. What's today? Oh yes, Labor Day, but no, the previous two were labor days. The family all busied themselves doing what had to be done in preparation. I moved bromeliads to protected areas, 'battened down' the greenhouse with its winter windows. Husband Roy assured me that if things got bad the greenhouse would be a safe place to be. He built it and said that it was built for hurricanes and not the winter chills. For two days I moved bromeliads in, under, and around protected areas provided by low growing shrubs that would not receive the brunt of the terrifying winds. Now the trees, loved so much for their summer and winter protection, are the true hazards of life, limb, home, and greenhouse, not to mention how the neighbors must feel with our large trees whipping and swirling from our yard to theirs. The force of the winds coming from the east is terrific. We can observe from our front porch that faces west the effects Hurricane David is having during the first half of the storm. Reading is impossible. Concentration on anything but David is very difficult. Such a helpless feeling! Taking all the hanging baskets, pots, and the many mounted bromeliads we collected in Mexico from the trees and fences is proving to have been a very wise thing to do. Would David never leave? A visit could be expected, but to stall in this area was getting a bit hard on the nerves. When the eye arrived (the calm at the center of the hurricane), we rushed outdoors to check the damage. The force of the wind would change direction as the eye passed over us. We viewed huge limbs down, trees up-rooted in neighboring yards, giant trees split and down, one narrowly missing my beloved greenhouse. Our hour of calm and it's time for more pacing. The bromeliads took the eastern force like troopers. Very few of the jammed-together pots were blown over. I felt reassured that they would fare much better than I had given them credit for. Trying to wish David away isn't working. Once you've prepared your treasures for the blow, stay indoors, cook extra food (before the power is lost), play games with your family, try to stay away from the windows. Watch the happenings from a protected spot away from the force of the winds, and sprinkle plenty of prayers in between. David has moved on. I get a terrible sense of guilt at the relief I feel that he is wrecking havoc elsewhere. News reports that he is losing steam are rewarding. Everyone is the neighborhood is outdoors. The chainsaws are hard at work. The clean-up chores will take days. I had to wade in the standing water to get to many of the bromeliads in the back yard. They survived the forces of the wind, now they might rot! Time to get them out of the low areas of the yard to higher ground. Many shaded areas are gone. The trees look stripped and pitiful, but at least they are standing. The temperatures are predicted to be in the 90's tomorrow. Wind, rot and sunburn. I feel very sorry for the punishment the bromeliads will have to endure. If any plant can take all of these things and still persist in living, why would anyone not choose to grow bromeliads? We're anxious to check the damage in the wooded areas close to home. Our lovely native bromeliads, high in the trees, must have taken a real beating. Times such as these, with high water, are not the most favorable for tramping in the woods where snakes and other wildlife are seeking the same kinds of shelter we humans did during a hurricane — high ground and protection from devastating winds. There is plenty here at home to keep me busy until the waters recede. Many of our bromeliads were too large to be moved, were planted in beds, mounted on logs, palm stumps, lower tree limbs and the like. They had to be left to the elements. The following are but a few that not only survived David, but did it far better than I. Aechmeas: 'Burgundy', caudata var. variegata, blumenavii, cylindrata var. micrantha, distichantha (canaliculata, glaziovii, and schlumbergeri), eurycorymbus, gamosepala, lingulata, lueddemanniana, maculata, mexicana, mulfordii, nudicaulis, ornata and more. Ananas bracteatus var. variegata, Androlepis skinneri, Billbergias of all shapes and sizes, Bromelia serra var. variegata, Cryptbergia 'Rubra', Dyckia species. Neoregelias: carcharodon, 'Catherine Wilson', concentrica var. plutonis, cruenta, 'Marcon', 'Marplex', marmorata, spectabilis, zonata and quite a few unnamed hybrids. The Portea species, being rather large, were expected to be damaged. The very tall bloom spikes of leptantha and petropolitana var. extensa were broken and beaten. The plants are in very good condition. The Quesnelias arvensis, marmorata and testudo did not budge an inch. Tillandsias fasciculata, bartramii complex, concolor and tricolor held tightly to the lower limbs of the Hong Kong Orchid tree. The palm stumps hosted (and still do) Tillandsias fasciculata, valenzuelana, Aechmea calyculata, Cryptbergia 'Rubra' and Epidendrum tampense orchids, in large clumps. Not one of them turned loose. That was to name a few? These listed bromeliads received both the eastern and western forces of David's slow journey up the Florida east coast. Slight damage was noted from fallen branches. The lack of wind damage is amazing to me. My respect for bromeliads and their hardiness has increased even more. Articles and pictures are earnestly solicited. The articles should be in manuscript style — typed, using double space and a 65-stroke line. Only films (slides) can be used for color illustrations: black and white photos are necessary for black and white illustrations. Color photos do not make acceptable black and white reproductions. All material should be sent to the Editorial Office, 647 South Saltair Ave., Los Angeles, California 90049. For issue No. 1 - Jan. - Feb. copy must be in by October 20. No. 2 - Mar. - Apr. copy must be in by December 20. No. 3 - May - June copy must be in by February 20. No. 4 - July - Aug. copy must be in by April 20. No. 5 - Sept. - Oct. copy must be in by June 20. No. 6 - Nov. - Dec. copy must be in by August 20. It was a delightful surprise to see in the First Western States Biennial Exhibit a painting by the world-renowned artist Georgia O'Keefe called "Bromeliad". It was dated 1943. Notice has just been received of the death on November 29, 1979 of the well-known grower and hybridist, Ed Hummel. These photos of an aechmea taken in habitat in Brazil were sent to the editor for identification. She, in turn, forwarded them on to Lyman B. Smith at the Smithsonian Institution, who identified them as Aechmea caesia E. Morren. This information came as a surprise, for the plants of A. caesia seen in western nurseries in no way resembled that of the beautiful species shown in the photo. In fact, the plant of A. caesia in the editor's collection was so unprepossessing that she relegated it to the trash bin. 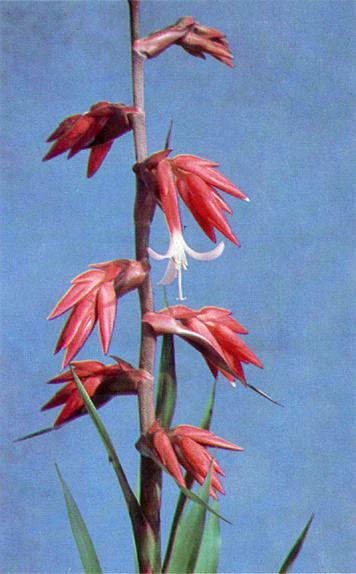 Then word came from Luiz Gurken of Rio de Janeiro, who had originally sent the pictures, that the plant had been identified by the eminent Brazilian botanist Dr. Edmundo Pereira as Aechmea flavo-rosea. He sent a type specimen on to Dr. Smith, who still maintains that beyond its beautifully barred leaves there is no difference from A. caesia. Dr. Smith writes, "Don't be confused if botanists disagree — it is only normal." When a plant is so lovely as this aechmea, what matters what it is called. Aechmea fasciata Baker is one of the most popular bromeliads produced by Florida nurseries. Seeds are often sown in flats and individually transplanted to containers; the six-inch size is particularly popular. One of the most serious diseases of A. fasciata can ruin entire flats of seedlings and older plants quickly become unsalable. Disease symptoms first appear as tiny, circular, yellowish spots on leaves (Fig. 1). Young and old leaves seem to be equally susceptible and within a few days great numbers of plants become seriously damaged if humidity remains high (Fig. 2). Small leaf spots enlarge, turn brown and appear sunken. They can enlarge until entire leaves are killed. Large leaves collapse and hang limply from the plant. If the surrounding air becomes drier, spots stop expanding, only to enlarge again when high humidity returns. Even plants that survive this blight are often too seriously damaged to be marketable. The cause of this disease is a fungus with the scientific name, Helminthosporium rostratum. Microscopic spores of the fungus are carried from diseased to healthy plants by air currents or are splashed by irrigation water. In only two or three days formerly healthy plants can show early disease symptoms and an epidemic starts if air is very humid. To prevent the disease, first of all use pasteurized soil or a disease-free potting mixture and keep diseased plants out of the nursery. If any are found, remove and destroy them immediately. One common source of fungus spores is a pile of discarded, diseased plants, so all sick plants must be removed from the premises, buried or burned. Keep the humidity as low as possible by circulating the air and avoid over-crowding the plants so that air can move between them. Whenever one leaf is found to be diseased, all plants must be promptly and thoroughly sprayed with a fungicide, covering upper and lower leaf surfaces. With this particular disease, one must be certain that the proper fungicide is used. For instance, although benomyl is superior for controlling some diseases, it will not control this one. Excellent control has resulted from thorough coverage of the upper and lower surfaces of all leaves with a spray of zinc plus maneb (such as Dithane M-45) as a 75 percent wettable powder at a concentration of 1½ pounds in 100 gallons of water. Chlorothalonil (Daconil 2787) or zineb (Ortho Zineb) also provided adequate protection in greenhouse experiments. Marlatt, R. B., and J. F. Knauss. 1974. A new leaf disease of Aechmea fasciata caused by Helminthosporim rostratum. Plant Disease Reporter, Vol. 58, pp. 445-448. Scene from a dentist's chair. Everyone should develop a hobby, preferably several hobbies. There are an extremely large number of retired people in Florida, a good many from the northern states, living in one of the countless retirement communities in this area. It is sad to me to see many of these retirees who come into my office as patients being miserable and frustrated because they have not psychologically prepared themselves for retirement by having a hobby. A person would do well to develop hobbies in his younger years — preferably one that can easily be followed when joints get "creaky" and the mind begins to fade. What more adequate and rewarding hobby could one develop than an intense and growing interest in bromeliads? They are certainly varied, and it is awe-inspiring suddenly to discover a plant that you have nurtured from seed or pup stage coming into flower. There are many rewards: the foliage, the form, the inflorescence, the sharing with friends, and possibly to many people, economic rewards. Another dividend is the many fine people you can come to know and enjoy. Foliage plants, and especially bromeliads, have been a vital part of my life for many years. Some time ago, I built a new dental office. You might say the office was built around my plant hobby with three large planters built into three of the four operatories and with individual specimen plants placed in other appropriate spaces. The fourth operatory looks out over a tree-shaded patio featuring azaleas, hanging baskets, and dozens of bromeliads. There are approximately 75 foliage plants featured in the office, including a number of specimen plants, and consistently beautiful bromeliads are used as accent plants. Bromeliads provide the icing on the cake in any foliage plantscaping. As luck would have it, the success of our indoor plants has far exceeded our fondest dreams. Many of our plants have been there since I first opened the office seven years ago. It has been a real dividend of my hobby to see countless patients gain much joy from the beautiful plants. It is also no longer a surprise when some horticulture professor drops in from a nearby university to see or get pictures of the plants. The office has been featured by one national dental publication. Possibly the greatest dividend for me has been seeing my two sons become intensely interested in foliage plants. They have formed a plant-leasing company, which not only provides a good living for themselves but for 20 employees as well. My wife would probably say our greatest dividend from my plant hobby has been her privilege of stepping into any one of our five greenhouses at any time for some gem to add to one of the seven built-in planters in our home. I am still young at 58 but will retire from dentistry in a few years. However, I don't expect to get old enough not to enjoy cutting off and potting another bromeliad pup or getting excited by the sudden discovery of a new beginning inflorescence on one of my choice bromeliads. What a dividend! There was once a time, not so very long ago, when the average bromeliad grower discovered that the chief problem was not so much how to grow the plant as how to find the plants to grow. This difficulty still confronts many of us who don't happen to live in the bromeliad's native land. There are, it is true, many more plants available now, both species and hybrids, some with names, some nameless or with names unknown, and more with names to which they have no right. It is not quite so necessary nowadays to grab every plant available, and hope for the best. There is at least a limited choice. In time we have to decide whether we are going to grow a mixed collection of whatever plants happen to take our fancy, grow mainly species or mainly hybrids, or specialize in certain genera only. There are still plenty of very nice species which deserve to be more generally grown and the number of species still being discovered is, to me at least, quite surprising. The hybrids are of course increasing still more rapidly, especially in the neoregelias. The tendency seems to be directed to producing plants with as much red in the leaf as possible. It does seem a little strange, though, that a plant with red leaves should be considered more beautiful than a normally colored plant. What would we say, I wonder, if we came out of the house one fine morning and found the lawn covered in bright red grass. Would it be considered an improvement? One difficulty confronting us when we order new plants is that there is no means of knowing, in many cases, whether the plant supplied will be from a good clone. There is in fact no system of awarding outstanding bromeliads along the lines of the system in general use for orchids. One would think that this idea must surely have been considered somewhere sometime. Such a scheme would encourage the production of high class clones of species and hybrids, and most growers would surely be willing to pay a little more for a guaranteed high grade plant. Some species can vary considerably, and in many ways a generally recognized certificate would be preferable to giving a clone some fancy name, which is really no guarantee of quality. 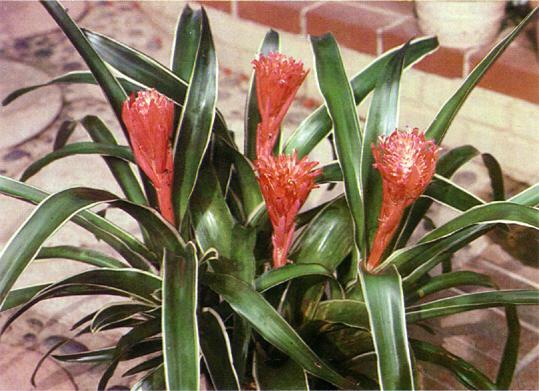 A few suitable candidates for an award are rarely found — Mulford Foster's original clone of Billbergia × Muriel Waterman for instance, Aechmea × Foster's Favorite and perhaps some clones of Aechmea chantinii. There has certainly been a remarkable increase of interest shown in bromeliads during the last few years, but there are still far to many people, keen gardeners too, who have never seen a bromeliad. Any scheme to make the plants familiar to more people might be considered just as worthwhile as new methods of culture. Shows and displays always create a lot of interest, but the excuses given by visitors for not growing the plants themselves are numerous and varied. This magnificent vriesea — one of the giants of the genus, is a native of the Organ Mountains, State of Rio de Janeiro, Brazil, where it grows at an elevation of 4,500 feet on barren, rocky slopes, enjoying both warm days and cool nights. It has been in cultivation a long time — although under various names — since 1888. It is a robust bromeliad, and as such, makes an excellent addition to the sub-tropical garden, both in sun and in shade, where a bold accent note is desired. It has been used with great effectiveness by the eminent landscape architect Roberto Burle-Marx. Its leathery leaves, measuring 6 inches in width and up to 5 feet in length turn a rich maroon if grown in good light. It is such a handsome rosette that it is highly decorative at all times, and the imposing 6-foot inflorescence with its shiny red bracts and yellowish flowers, which comes when the plant is 15 to 20 years old, is an added bonus, albeit a sad one, denoting as it does, the demise of the specimen. However, before this time the plant has put out a number of little plantlets around the base which can be detached and started off on a life of their own. They grow rapidly. The plant on the cover was grown by Bill Paylen in his southern California garden. It measured 8 feet in height and 5 feet in width. This charming guzmania, though seldom seen today in collections, has been in cultivation for almost a century having been first collected by Sanders & Co., of England, in 1881. It is native to Colombia where it has been found growing in the Andes at elevations ranging from 2,000 to 4,000 feet. It was first described by Baker in 1888, who classified it erroneously as a tillandsia. G. longipetala is deserving of a place in every greenhouse, for it is not only an attractive plant, but is small and thus would not take up much bench space. Its leaves, which are green with brown stripes, are 5 to 8 inches long. The inflorescence reaches 10 to 12 inches in height. The conspicuous white petals are 2 inches long. Soon after Christmas, I was on a plane bound for Ecuador, with a group of 15 orchid collections, led by Bob Fuchs. After landing in Quito, we got on our bus and headed for Puyo, in Oriente Province, where we stayed at the very comfortable Hosteria Turingia. Next day our collecting started. After going about two hours beyond Puyo and turning off on a timber cutter's road, we were in sight of the plains of the Amazon. We were at about 3,000 feet elevation in a lush jungle with fantastic flora, including a tremendous variety of aroids of all shapes and sizes. Soon I noticed an odd pitcairnia climbing on trees with long stolons. At first, only a dead spike with some seeds was seen. Later I observed the same species growing on the ground, where it got considerably larger, with a rather odd way of growing. One of these had a fresh spike — thick, vriesea-like, orange-red, unbranched, over a foot long, sticking right out. Really a handsome and odd plant! I hope the seeds and offshoots I brought back survive. In this area I also saw a streptocalyx in flower, with very pale, almost white bracts and beautiful small blue flowers. Joe Brenner, owner of the Hosteria Turingia, is also into plants. In a large urn on the patio was a beautiful flowering Aechmea nidularioides. At his nearby nursery many Aechmea zebrina plants were climbing on saplings. There were many orchids and other choice plants in his collection. Next day we left for Riobamba, retracing our tracks on the fantastic road between Puyo and Banos. This is a one lane, dirt, climbing along one side of the beautiful Pastaza River gorge with sheer drops of hundreds of feet off one side, and no guard rails. At times you could almost be looking out of an airplane. There were one lane bridges, crossing deep chasms, and a one lane tunnel. Several times we had to back up to a wide place in the road and wait while another bus or small truck passed from the other direction. The mountains were most beautiful, and several high waterfalls, as well as the most impressive Agoyan Falls, where the Pastaza River itself fell through a narrow cliff, were thrilling to see. We had seen a species of Sobralia orchid with white flowers growing on road cuts, and we stopped to collect some of them. Here I got a plant and seeds of a small species of pitcairnia, which had a beautiful spike, shaped like a pagoda, orange-red. Farther up, at higher elevations there was yet another species of pitcairnia, something like P. heterophylla, but with wider leaves, and a tall spike. These were mostly just putting out fresh new leaves, but a few were seen in flower. On the dry mountainside above Banos a species of large puya was making a stand, although badly charred by fires. There were many species of terrestrial orchids there also, but most had been burned. Everywhere, the natives tend to set fire to the indigenous vegetation and convert everything to cow pastures, as in Costa Rica. It's very depressing to a plant lover. Many orchids and puyas were destroyed by the fires. We spent the night in Riobamba, 7,500 feet elevation — quite cold. Next day, we were rolling along the grass-covered mountains, with marvelous views down into the valleys, and cloud-covered high Andes peaks towering above us. We crested at 12,100 feet and then started the long descent down to sea level at Guayaquil. Soon we were back in lush forests, with spectacular bromeliads in flower, on trees, shrubs, roadside cuts — mostly guzmanias, some with tall, red and yellow branched spikes. We finally stopped to collect and found G. monostachia growing in roadside cuts in flower. Everyone admired it. I was the only bromeliad/palm nut in this group. I found a different species of deciduous pitcairnia here. At a lower elevation I found tillandsias in a citrus grove among many species of miniature orchids. At low elevations, just before leaving the mountains, there was a giant pitcairnia — giant clumps, leaves well over five feet tall, with unbranched dead spikes, full of seeds — but I could not manage to reach any of them. I did manage, however, to dig up a couple of small plants, growing lower down. They have an interesting custom in Ecuador. At New Year's, they make life sized effigies out of straw, dress them up like people they do not like — the politicians, the old year, etc., sometimes making tableaus on a platform. Then at midnight on New Year's eve, they are thrown into the street, kerosene poured all over, and they are set on fire. This is to destroy the old, bad things of the old year and start the new year fresh and clean. The streets of Guayaquil were really wild, with the fires everywhere, and cars dodging through. Ecuador is a most beautiful, varied country, and abounds with bromeliads. It is a wonderful place for any plant collector. Our trip, though short, was most satisfying, and all my plants came through alive and unfumigated. The Sheraton-Twin Towers in Orlando, Florida, 1980, is a far cry from the beginnings of The Bromeliad Society in 1950. It is altogether fitting that the 30th Anniversary be celebrated in Orlando, however, since it is the home of one of the founders and the first president, Mulford Foster. It is sad that he, and so many of those who collected with him, grew, hybridized and promoted bromeliads cannot be present to celebrate this 30th Anniversary with us. Their names will be well represented on the plant registration tags, and, Florida bromeliad lovers hope to do justice to all their contributions by presenting a really memorable World Conference on May 1 through 4, 1980. May 1, 1980, all day, will be set up day for the show. Plants will be registered then, affiliate societies will set up their displays, sale plants will be assembled, guests may register, confusion will no doubt reign supreme. Exhibitors who cannot enter plants on May 1, can, with advance permission, bring them in before 10:00 a.m. on the second. Judging will begin at 10:00 a.m. on Friday, and hopefully be completed to open the floor by 3:00 p.m. There will be tours to private collections (including Mulford Foster's Bromel-a) each morning of the Conference. The seminars will be held in the afternoons so our guests can avail themselves of both activities. There will be organized entertainment at the hotel on Friday evening and an Awards Banquet on Saturday evening. That is an outline of the events. As a tribute to Mulford Foster, the artist, this World Conference will include a showing of commercial bromeliad art by those contemporary artists who choose to participate. Many will offer their work for sale. All commercial space has been sold. There will be 22 commercial growers selling, with 2640 square feet of booth space, plus ample aisle space. Many of these growers will offer the convenience of credit card purchases. Our member plant sale area will be comparable in size to the commercial space. We encourage our members (from anywhere in the world) to consign plants to us for sale. We will collect 25% commission. There will also be a miscellaneous sales division for bromeliad related items other than plants, such as books, ceramics, containers, t-shirts, etc. We will collect 25% commission on these items also. Our formal show, affiliate displays, and art show will cover an area of 22,000 square feet. Affiliates are invited to exhibit and all have been so notified. Each exhibit will be 10 feet by 10 feet, free standing, to be viewed from all sides and will be judged by landscape rules, so the use of name tags on plants is discouraged. It is our goal to have in excess of 800 plants entered for competition. Seed Fund — Seeds for sale and exchange. For information and seed list, send stamped, self-addressed envelope to Diana E. Pippin, P. O. Box 2352, Riverside, California 92516. Plant Identification — For identification of your bromeliad, send whole plant (if small) or an entire leaf, plus the sheath, the inflorescence including a flower, and as complete a description as possible as to habitat and the natural growing conditions to The Bromeliad Identification Center, Marie Selby Botanical Gardens, 800 South Palm Ave., Sarasota, Florida 33577. Check or money order for $5.00 per specimen should be made out to The Bromeliad Identification Center and forwarded by separate mail. The fee goes towards maintaining this excellent center. Hybrid Registration — To register your hybrid, send for application blanks and rules to Hybrid Registration Chairman, The Bromeliad Society, P. O. Box 41261, Los Angeles, California 90041. Bromeliad Film Library — Interesting programs for affiliated groups. For information and availability send stamped, self-addressed envelope to Mrs. Thelma O'Reilly, 10924 Sunray Place, La Mesa, California 92041. Formation of Affiliated Society — For information as to setup and regulations, write to The Affiliate Chairman, The Bromeliad Society, P. O. Box 41261, Los Angeles, California 90041. Thirty years ago when this Society had its beginnings, billbergias were among the first bromeliads to find their way into collections. They were easy to grow and to propagate, their foliage in most instances was varied and oftentimes spectacular, and their inflorescences were among the most colorful in the entire family. They had one drawback, however, and that was the ephemeral quality of the bloom, seldom lasting more than a week or two at the most. It was for this reason, perhaps, that the billbergias seem to have lost favor in recent years. This is regrettable, for a well-grown billbergia is a handsome plant whether in flower or not. The billbergia in the illustration is B. pyramidalis 'Kyoto', an introduction from Japan. It is a husky plant, doing well in the open garden, but grown as a container specimen, it has few equals. This particular plant lasted in color for over six weeks.